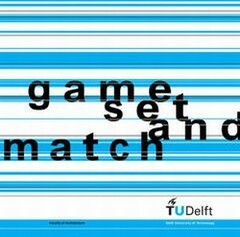 The book "GameSetandMatch", is a full report on the gamesetandmatch conference proceedings held on Dec. 13th 2001 at the Faculty of Architecture of Delft University of Technology. It encompass a text from each speaker. Just like the conference the subject of the texts circle around the notion of interactive architecture, the real-time active, data driven and intelligent environments comparable to computer games. Architecture becomes a game being played by its users. And not only architecture will be subject to the forces of real time calculation. Also planning, construction, interior design and landscape design are ready to be developed as real time games. During the design process the game is designed by the architect and played by all parties involved. During the life cycle of the building and the built environment the game is played by their users, by the visitors and by the built environment itself. Visitors become participants in the experience economy. By playing the game the participants set the parameters. Each actor triggers an array of sensors writing the new data to a database, from where the building picks up the new data and starts reconfiguring itself, in shape, in content, or both in shape and content. Then the new configuration will match to the desired conditions. It is fair to say that the building will find itself in a state of continuous operation. The building, consisting of numerous co-operating programmable elements, will behave like a swarm. The building elements will show flocking behaviour, always keeping an eye on the neighbouring actor, always ready to act and react. Hence we propose a new motto for the discipline of architecture: "Game, set and match". To be played over and over again. architecture is turning wild.